Today we're going to learn about all the ways that your Twine game can be responsive to the choices of your reader, including "remembering" information from one passage to the next, and making the shape of your text contingent on what choices the reader has made. We're going to talk about macros, variables, and functions. 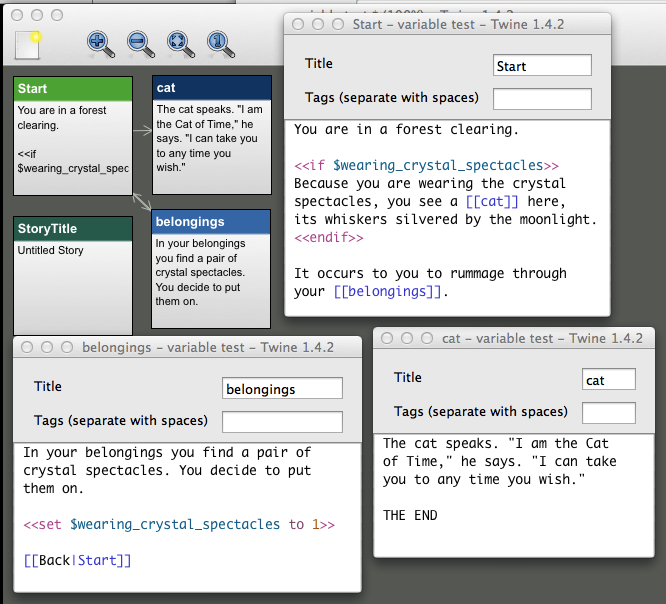 A "macro" is a bit of pre-defined code that you get for free with Twine. Among other things, macros allow you to keep extra information in your game behind the scenes, and then change the way your story is displayed based on that information. ... i.e., two angle brackets surrounding something, where something is the name of the macro you want to use. (Some macros have other information between the brackets, as we'll see below.) Note that macros are not HTML tags! They only work in Twine, not in any old web page. This looks complicated, so let's break it down. 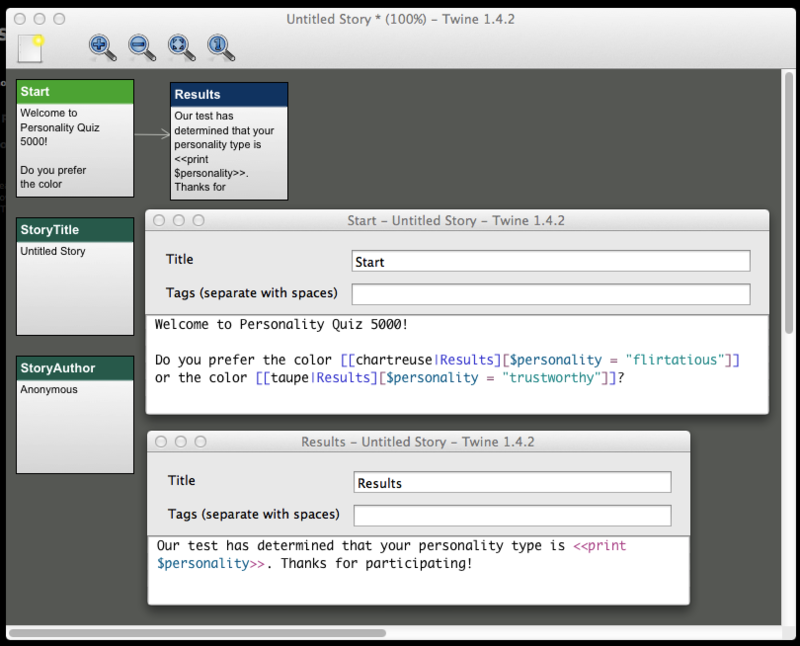 The word textinput indicates to Twine that we want to use the textinput macro, which causes a text input box to appear on the screen. The textinput macro needs a little bit more information to do its job, though. Secondly, the reader needs to go to a different passage when they click the button next to the text field. The name of the passage to link to is contained inside the square brackets. And yes, it does look just like a Twine link! You can even change the text on the button using the pipe syntax, just like with a link. For example, this code would change the text on the button from "Greetings" to "Click me!" Altogether, you can read the macro as saying: "Hey, Twine! Make a text input box. Whatever the reader types in, remember it in a variable named $player_name. Oh, and when the reader clicks on the button, send them to a passage with the name Greetings. Thanks!" ... in the Greetings passage. This causes whatever value we stored in the variable $player_name earlier to be included in the text of the passage. 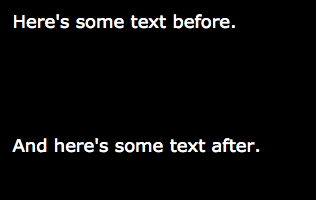 EXERCISE: Make a Twine game that asks the reader multiple questions about themselves, one after another. (E.g., "what's your name", "what's your hair color", "think of a number from one to fifteen", etc.) In the final passage, display all of the information that the reader typed in. Read more about the <<textinput>> macro here and about the <<print>> macro here. 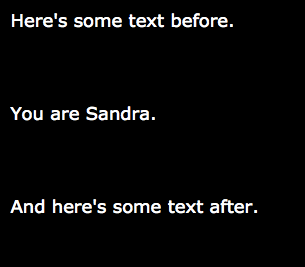 Here's a screenshot of a simple Twine game that makes use of the <<set>> macro. You can see here the use of <<set>> to manually set a variable to a particular value, in this case either "trustworthy" or "flirtatious". The <<set>> happens when the reader clicks on the passage in which it occurs; the variable stays set for the entire playthrough. The <<set>> macro allows you to set variables to different kinds of values. In the above example, the value we set for $personality to a kind of value called a string. Strings contain "strings" of characters, and are what you want to use for any textual information you want to store. When you make a string value, you have to surround the value in double quotes "like this". The <<set>> macro can also set numerical values, like 5 or 19.42. When you're writing a number, you don't have to include quotes. The difference between these two kinds of values---strings and numbers---will become more apparent later on, when we talk about expressions. For now, just file away the idea that they're two different things. EXERCISE: Create a Twine game that <<set>>s a $score variable for a reader, based on which of several passages they choose in the game. Have all passages lead to a "Game Over" passage that displays the $score variable. The variable $favorite_color will now be "blue" until the end of the story (or until your story changes its value again!). 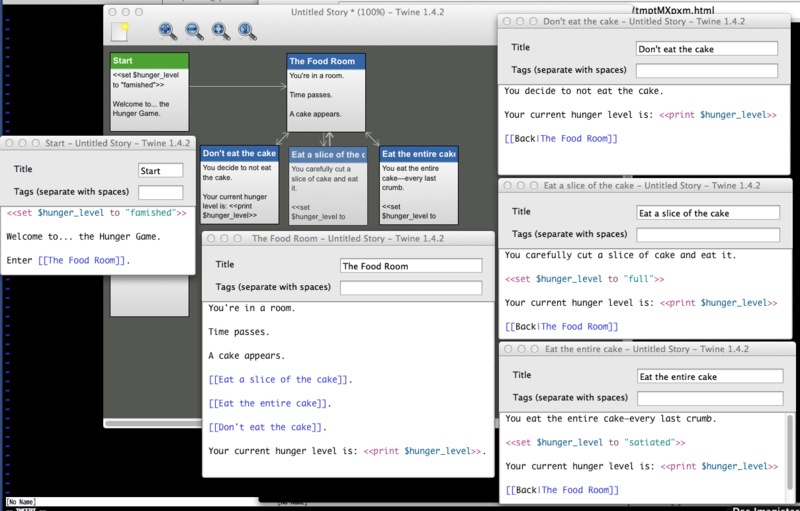 Here's an example game that changes a variable that tracks the reader's hunger level in response to the choices that they make. As you play through this game, your "hunger level" will change, based on how much of the cake you choose to eat. How does this work? We first set the variable $hunger_level to "famished" in the Start passage. In the The Food Room passage, we display the $hunger_level with the <<print>> macro, and then link to several new passages. Each of these passages then links to another passage; these passages use <<set>> to change the value of the variable. When the reader returns to the The Food Room passage, it reflects the new value assigned in the other passages. It's common to want to change a variable's value based on what the value currently is---say, for example, you're keeping track of a player's score. You might want to increase (or decrease) the user's score by some amount, without having to set the value to some exact number. 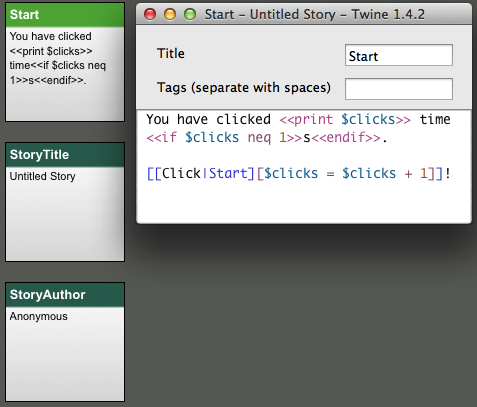 There's an easy way to do this in Twine using expressions. An "expression" is some combination of values, variables and operators that the computer examines and evaluates, producing a single value. We'll talk more about expressions below (what they are, how they work, and the rules for putting them together). But for now, here's how to write an expression that makes the <<set>> macro increase a variable by one. The $score + 1 in the above code is the "expression" in question: essentially, it's an instruction to the computer to figure out what the value of the $score variable is, with 1 added to it. 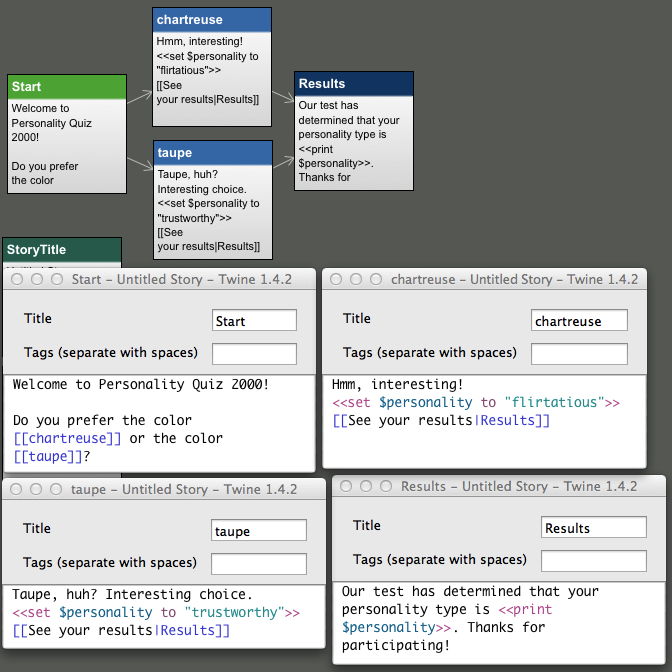 Here's an example Twine game that increases the number of "widgets" in the player's possession every time they visit a particular passage. This macro causes the value in $widget_count to increment by one. When the variable is <<print>>ed in the Showroom passage, you can see that the variable has been changed. You can replace + in the expression below with - if you want the value to decrease by one instead of increasing. You can also change the number: if you put 20 instead of 1, the value will increase by twenty instead of one. Give it a try! At this point, we know how to set variables, print variables, and how to change the value of a variable after it's been set. 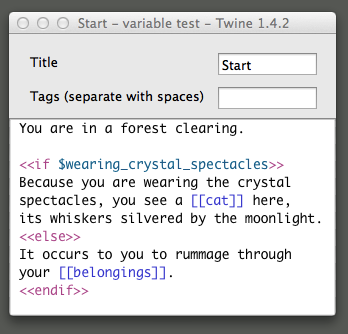 Now we're going to learn how to make our Twine stories do different things based on the value of a variable. The <<if>>/<<endif>> macro checks to see if the value in a variable meets certain criteria. If it does, then the text (and other markup) between the <<if>> and <<endif>> gets displayed. If it does not, then nothing happens. In the example above, the phrasing is a little awkward: the reader is invited to go through their possessions to look for the crystal spectacles even if they're already wearing them! That's not quite right. Ideally, we'd like to have a way to say something like: "If the $wearing_crystal_specs variable has been set, then do this. Otherwise, do something else." The code above would display the text You've got the key! if the variable $player_has_key is set. If not, it displays You need a key. :(. Okay, now we're cooking with gas. But let's take it one step further. Say we want to make a story where the reader starts with five coins, and then spends the coins one by one. At that point, we want the game to stop and display a different passage, informing the player that they've spent all of their coins. We can't quite accomplish this with just the tools we've used so far, however. We need to check not just if the $coin_count variable has been set, but if it contains a specific value. For this, we need to learn about a new thing: operators. The operators we'll look at in this section allow us to perform a test by comparing two values in relation to one another---for example, checking to see if two values or equal, or if one value is greater than the other. We say that the expression "succeeds" or "returns true" if the test describes the actual state of things, and that it "fails" or "returns false" otherwise. The way it works is this: you put the operator and both values right after if in the <<if>> macro. The <<if>> macro will display its text if the comparison "succeeds." The above code will display the text You're out of coins! if the value of $coin_count is 0. So let's write the story! In Start, we initialize $coin_count to 5. First, we check to see if the reader has any coins left with <<if $coin_count is 0>>. If the count is zero, we know that the reader has spent all their coins, and display the "game over" message. Then, in the <<else>>, we use <<set>> to decrease the number of coins in the reader's possession: <<set $coin_count to $coin_count - 1>>. In Flea Market, we display the number of coins the player has left with <<print>>. EXERCISE: There's another <<if>> macro in Flea Market that controls whether or not the s gets displayed after the word coin. Describe in prose how this macro does its job. is: true if the left value is equal to the right value. neq: true if the left value is NOT equal to the right value (neq is short for not equal). >: true if the left value is greater than the right value. <: true if the left value is less than the right value. >=: true if the left value is greater than or equal to the right value. <=: true if the left value is less than or equal to the right value. This madeleine is only for Josephine! Go away! You can also combine expressions using the operators and and or. The and operator takes two expressions, one on its left, and the other on its right, and counts as "true" if both expressions are true. The or operator similarly takes two expressions, and counts as "true" if either the left-hand expression is true, or the right-hand expression is true (or both). The expressions on either side of and and or should be surrounded by parentheses. You are either really good at this game or really bad at this game. You have more or fewer than zero points! Good job. And here's some text after. What's worse, even if the <<if>> macro condition is true, we still have extra whitespace! This is pretty annoying from an aesthetic perspective. Thankfully, there are ways to fix it. This is fine (try it out!) but it's a little bit confusing, because the <<if>> macro is in a strange place. Ideally, we'd like to be able to retain the whitespace in our code, as a means of keeping things clear, while still avoiding the appearance of unwanted whitespace. Read more about the nobr macro. ... where Text of link is the text that the link should display, PassageName is the passage the link should go to, $variable is the name of the variable you want to set, and value is the value you want to set the variable to. Read more about setter links. 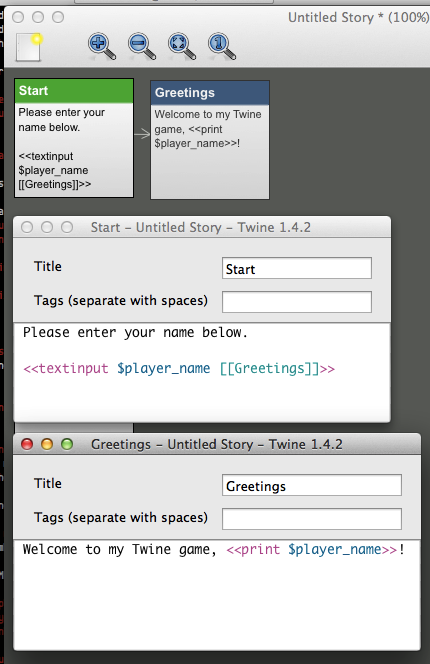 Twine has still another way for you to introduce interesting behavior into your stories: functions. 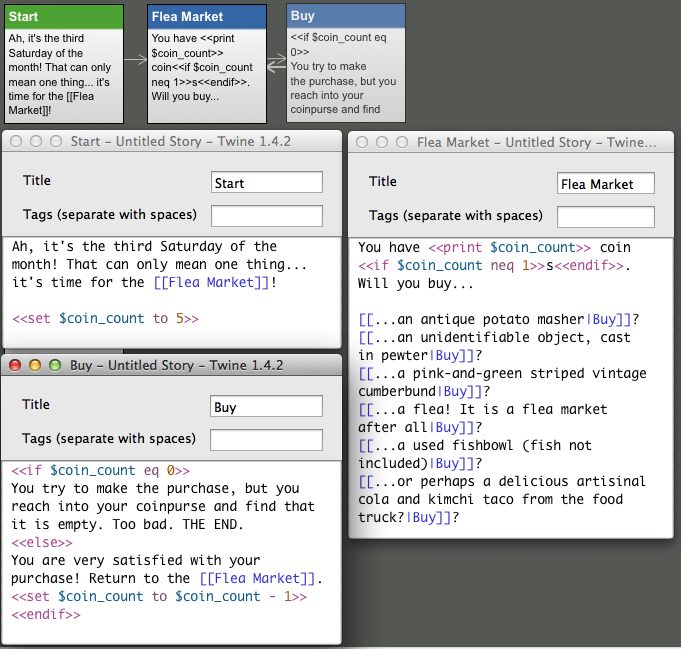 A "function" is a little piece of code, defined by Twine behind the scenes, that you can use in your Twine code as if it were a value or an expression. We'll talk about a few of these below. You die, finally and painfully. You have a fondue party with all of your closest friends. You have visited the cheese shop <<print visited("Cheeseshop")>> time(s). "Training">>you have no formal education<<endif>>.